Here is what the young racing driver has to cope with that athletes don't. Usain Bolt doesn't run away from you because he just laid out ten grand on a pair of trainers yesterday and found an immediate 4 tenths. Athletes and drivers train hard and risk the possibility of physical injury. But athletes don't face the possibility of losing everything because of a random chain snapping event. I don't remember the last fatality in an athletic event. 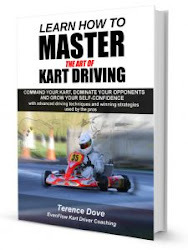 Even karters have to face the possibility of broken bones and pain, as well as fears of crashing. We've all has at least one 'biggie'. The 'at the track' racing environment is hard-core. Athletics is run by very protective, psychologically aware coaches. Racing drivers have no such luxury and do their competing in a very tough environment where generally nobody gives a monkey's how you feel - and in many cases the driver is blamed for everything that goes wrong. The racing world is the toughest environment I can think of full of unfairness and corruption alongside tremendous highs - and that is why it has the potential to develop very special people, who manage to use that environment to reach the pinnacle of human development.